In an effort to promote the coverage of live violin performance, Violinist.com each week presents links to reviews of notable concerts and recitals around the world. Thank you for joining us today for the 100th edition of the Week in Reviews! 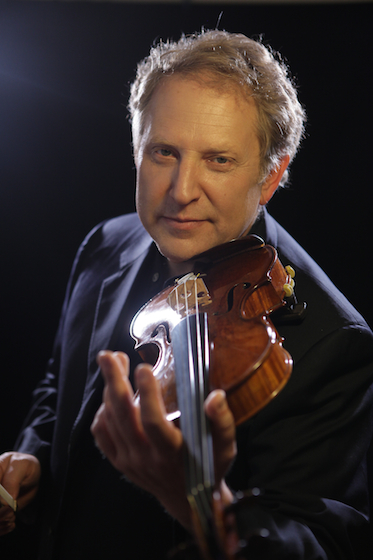 The Plain Dealer: "But the most moving use of a "Hope" violin Sunday came courtesy of star violinist Shlomo Mintz, a co-founder of the project. With Mendelssohn's Violin Concerto, on an instrument rescued from unspeakable tragedy, he produced 30 minutes of musical joy, a half-hour of melting beauty, heartfelt lyricism, and playful virtuosity." Rachel Barton Pine performed the Brahms with the Flagstaff Symphony Orchestra. Arizona Daily Sun: "The technically challenging Brahms concerto offered much opportunity for demonstration of brilliant technique, bravura projection of sound, and the 'passion and conviction' noted in her biography. Throughout her thrilling performance, the amazing sonic qualities of the 1742 Guarnerius instrument of which Rachel Barton Pine is the current custodian was afforded ample demonstration." Benjamin Beilman performed Saint-Saëns' Violin Concerto No. 3 with the Eugene Symphony Orchestra. The Register-Guard: "The 25-year-old violinist brought polish and extraordinary sensitivity to the first performance of this concerto in the orchestra’s history. Elegantly delivered melodic lines and highly nuanced phrasing proved to be the violinist’s calling cards." Jaime Laredo performed and conducted Mozart's Violin Concerto No. 3 with Vermont Symphony Orchestra. Times Argus: "His performance combined a brilliance, virtuosity and nuanced tenderness few offer." Pinchas Zukerman performed the Beethoven with the Dallas Symphony Orchestra. Star-Telegram: "Zukerman produced some lovely sounds, always lyrical and agreeably playful in the finale. Van Zweden and the orchestra were like-minded partners." The Dallas Morning News: "Zukerman’s account of the Beethoven Violin Concerto was certainly an odd one. With a huge sound from his Guarnerius instrument, he could dispatch one busy passage with impressive virtuosity, then carelessly rush through two others." James Ehnes performed the Glazunov with the BBC Scottish Symphony Orchestra. The Arts Desk: "James Ehnes (pictured above) made light work of Glazunov's short Violin Concerto. His playing is rich and precise, even slightly cool, but it was overlaid on an accompaniment that was perfectly judged." Augustin Hadelich performed the Brahms with the Pittsburgh Symphony Orchestra. Pittsburgh Post-Gazette: "Mr. Hadelich delivered a patient, transparent interpretation that let Brahms’ materials speak for themselves. His luminous, natural sound popped off the strings, and I half-expected a human voice to emerge from his instrument." Pittsburgh Tribune-Review: "He was both impressive and distinctive in Brahms' Violin Concerto. Hadelich has a beautiful sound, never overripe and thus suited for eloquence. He has the gift of unfolding familiar melodies with freshness and sincerity." Jonathan Carney performed the Glazunov with the Baltimore Symphony Orchestra. The Baltimore Sun: "BSO concertmaster Jonathan Carney has done notable work as soloist before; here, he outdid himself. The violinist's warmth of tone (endangered only when pushing hard in a few spots), poetic intensity of expression and pristine articulation served the score well." The Washington Post: "In the Glazunov, while his lyrical playing was eloquent, in virtuoso passages it was not always in tune or well-articulated. But it was a fully professional outing, and he is an undeniable asset." Here is a video about "Violins of Hope," featuring Shlomo Mintz and violin maker Amnon Weinstein, who restored 26 violins that had been played in Jewish ghettos and concentration and extermination camps during World War II. Hah! I am old enough to remember sharing the same canteen and corridors with Johnathon Carney. Played beautifully even when young.